New Delhi, May 25 : Union Human Resource Development Minister Prakash Javadekar on Thursday said that the Central Board of Secondary Education would declare the results of Classes 10 and 12 on time. “CBSE results will be declared on time, the date will be told by CBSE. No need to worry about the court’s order, justice will be done for all,” Javadekar told reporters here. 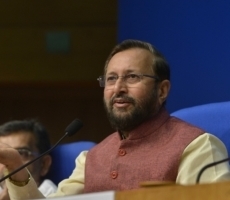 Javadekar’s remarks came in the wake of the Delhi High Court’s direction to CBSE not to implement its decision to scrap its moderation policy on marks this year. The court had noted that the CBSE had decided to do away with the moderation policy after the students had taken the examinations. The court’s direction came on a Public Interest Litigation (PIL) that contended that the policy should not be done away with this year since it will affect students of Class 12 who have applied for admissions abroad. The petition was filed by a parent and a lawyer, saying the policy was changed by way of a notification after the exams for the year were held and hence would have a drastic impact on the students.